What are the features that sell homes in the Harris County, GA real estate market? There’s a list of details that perspective buyers can list off in the preliminary stages. We’ve touched upon some of these in the past, including an energy efficient home, a great school district, a nice kitchen, a big lawn, and more. Of course, if you’re looking for a hunting property or a summer home, you’ll be looking for something more specific. A recent study from the National Association of Home Builders (NAHB) showed what buyers are really looking for in a home in 2015. Some of these features may be obvious, while others, such as the importance of organizational spaces, may be surprising. According to the study, four of the top ten features that new homebuyers are looking for deal with energy efficiency. Included in this was Energy Star rated appliances, windows, and ceiling fans. We discussed what it means for a home to be energy efficient in a recent blog post, breaking down the differences between LEED certified and Energy Star ratings. Whichever ratings you choose, new homes are becoming more and more energy efficient. 38% of newly built homes today are energy efficient. Homebuyers are willing to pay $7000 more for an energy efficient home to save $1000, as 73% said potential utility costs would play a role in their purchasing decision. The second most important feature that homebuyers are looking for deal with organization. 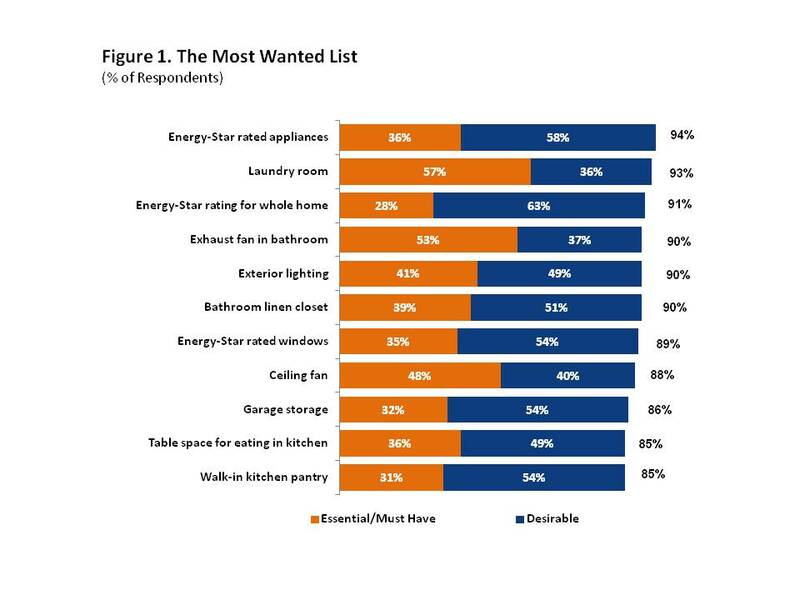 93% of homebuyers wanted a laundry room, with 57% saying it would be a deal breaker for a home to not have one. That percentage ranked the highest in the essentials category. 86% of buyers who took the survey said they looked for garage space to store sports and gardening equipment. A linen closet to store towels in the bathroom and a walk in pantry also ranked high. So what details and features turn off homebuyers? In the same manner as energy efficiency, features that waste energy or space turned off buyers. 70% of buyers said they would avoid homes with an elevator (in fact, two story homes are also on the outs). Having a bathtub in the master bathroom was important for over half of respondents. Interestingly, the other features that were undesirable to buyers were more about the community surrounding a home. 66% of homebuyers said they would not want a home in a golf course community, with 56% responding they would not want to purchase in a high density area. What features do you look for in a home? Call me at 706.662.0125, or email me today! Be sure to check out my available listings in Harris County, GA.